This post will be a short departure from woodworking, and will be about my ongoing experiments with my “Primo-brand” smoker. 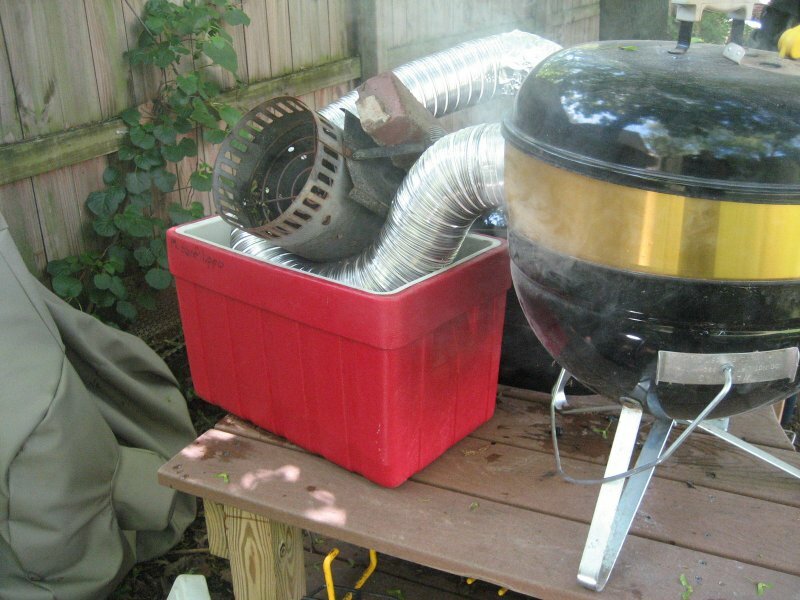 Last winter my son and I watched an Alton Brown “Good Eats” episode on Food Network TV that showed him making both a “hot” smoker and a “cold” smoker out of hardware-store parts and other misc junk. A “cold” smoker is used to smoke things like cheese that cannot get hot during the smoking process or they will melt. You want to smoke without cooking the food. The temp needs to stay somewhere below 90-degrees (F) while still providing a lot of smoke to the cheese. 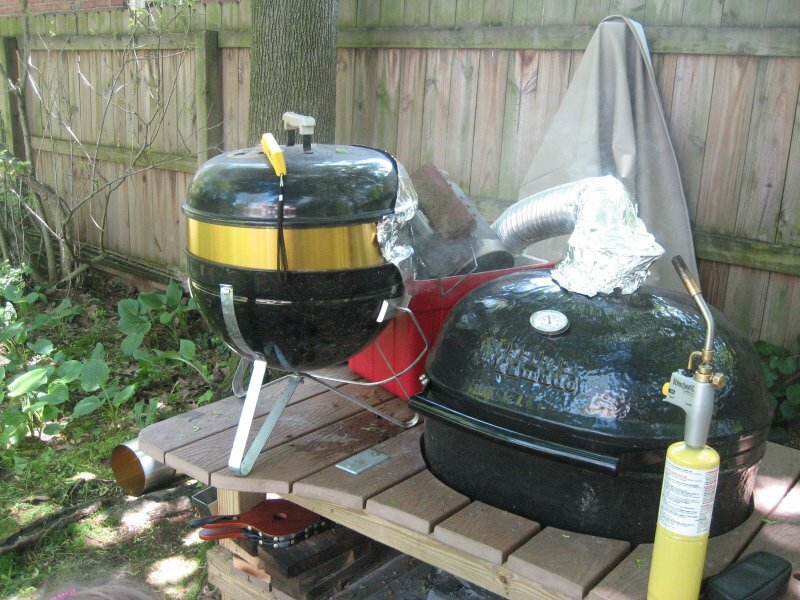 We wanted to try to build a cold-smoker by creating something that would mount on my Primo “hot” smoker rather than starting from scratch as Alton did in the show. The goal is to pull the smoke away from the grill that has the fire and heat in it, while letting the heat escape elsewhere. Our contraption consists of a typical hardwood charcoal fire in the Primo grill (the large black thing built into the tabletop) with a quantity of apple wood on top of the coals to generate the smoke. The internal temp of the Primo is stable at around 300-degrees for this experiment. I then attached a 6 foot length of flexible aluminum dryer vent pipe to the top vent of the Primo’s lid and roughly sealed the connection with some aluminum foil. I used my charcoal chimney with a brick on it to weigh down the pipe into the water. The dryer-vent pipe then terminates between the lid and base of my small tabletop Weber grill that we use when we go to a park or somewhere that requires grill portability. I then filled the rest of the gap between the base of the Weber grill and the lid of the Weber with a bent piece of aluminum roofing-flashing (the gold colored stuff). It is plain aluminum on the inside so as to not contaminate the food with any chemicals. The lid then sits on the aluminum gap filler as shown below. There is no fire or charcoal of any type in the Weber grill. The cheese (or other food for cold smoking) sits on the Weber’s grate as normal, but the only thing happening inside of that grill is the delivery of smoke from the dryer vent-pipe. The grill is otherwise empty (I forgot to take photos of this). You can see the yellow thermometer on the lid of the Weber in the photo above. It reads 63-degrees (F). We never broke 71-degrees through the entire smoke! The contraption worked great. You can see the back of my son’s head in this photo pushing air into the Primo with a small set of fireplace bellows. Not sure that this was necessary, but it did increase the smoke volume from time to time (although there was plenty of smoke anyway). For the first batch of cheese we smoke pieces of cheddar, provolone and mozzarella (all at the same time) for 45 minutes. Wow, were they smoky!! I think that 45 minutes was a bit too long and the cheese was a little harsh for me, but some tasters quite liked it. Next run will be less than 30 minutes. Note that cheese smoked in this way hardly changes color at all unlike the “smoked” cheese you get in the grocery store. I am told that the color on the store bought smoked cheese is artificial. All-in-all, this was a fun, easy and cheap (less than $20) experiment that mostly succeeded. I would say that the device works well, and we just need to work on smoking time, recipe, etc. 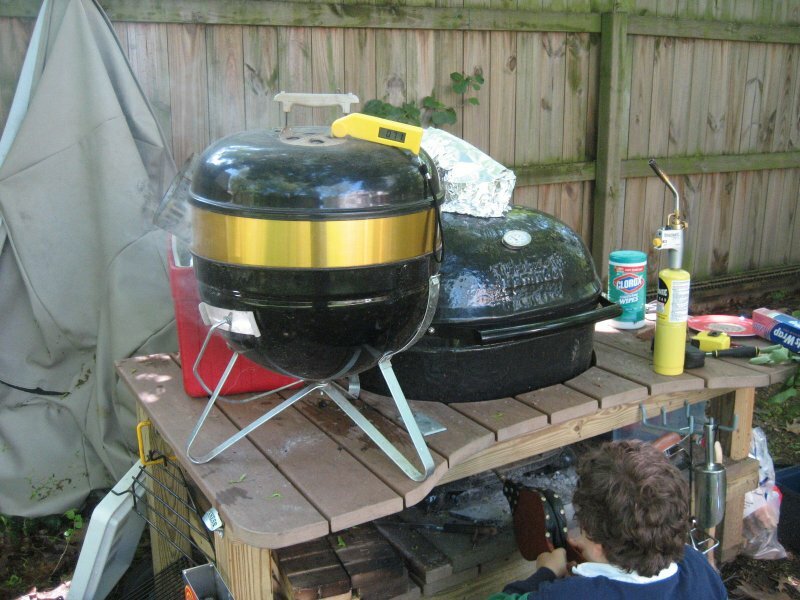 Posted on May 13, 2008, in Grilling, BBQ and Smoking. Bookmark the permalink. 1 Comment. Really good story. Thanks for the post. Keep it up, you do a great job.